OVERNIGHT SHIPPING MUST BE SELECTED FOR GUARANTEED LIVE ARRIVAL! Will NOT Ship Ground Delivery. Producing quality honey depends largely upon keeping a quality colony, and a quality colony begins with well-bred queens. Raising honey bees does not have to be difficult when you find the right honey bee queens for sale. 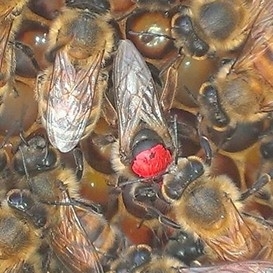 Buying queen bees is an endeavor fraught with perils because you never know their history or how they were raised. However, our live queen bees for sale have been bred through years of natural selection from our most productive northern hives. We do not purchase any southern stock to breed with our northern bees. In addition, we purchase breeder queens from several sources, Michael Palmer, including Sue Colby, pioneers in bee breeding. Wild Creek Bee Farm has come to be one of the most reliable queen bee suppliers in North America, and our passion extends well beyond the business. It is a personal hobby that we enjoy sharing with others.